Housing options, especially rentals, vary throughout the Wood River Valley, but Cold Springs Crossing not only delivers modern living at a comfortable rent, but also the complex is built with top-quality products and includes a level of craftsmanship that distinguishes Sun Valley from other mountain resort communities. 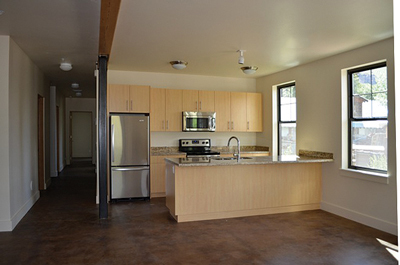 Only a mile and half from the center of Ketchum, Cold Springs Crossing is an award-winning, energy-efficient, and state-of-the art rental apartment complex with all the comforts and modern amenities for mountain living available. With views of Baldy, steps from the bike path, and reliable public transportation, Cold Springs Crossing is the Sun Valley regions most attractive housing complex. The complex includes three-bedroom units comprising 1,463 square-feet, two-bedroom units with 1,005 square-feet, and one-bedroom units with 777 square-feet. In addition, each unit has an oversized garage with room for sports gear, equipment, and any other storage needs, and it can even fit two cars. Outside parking is available at the complex, as well. For each unit, a combination water heater and storage tank and a utility box are housed in the garage. The units include smooth granite countertops, energy-efficient windows, and gas fireplaces. High-volume ceilings are an attractive feature in the upstairs units; these are even higher than the spacious ceilings found in all the units. Architect Michael Doty of Michael Doty Associates designed and planned Cold Springs Crossing. 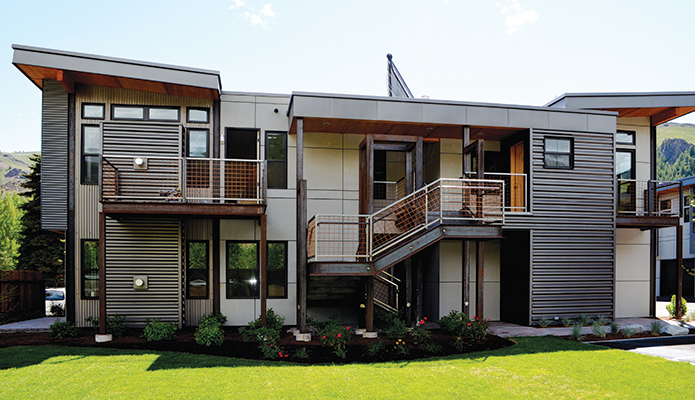 It is National Green Building Gold-certified, and Cold Springs Crossing’s energy-efficient units feature solar-powered heating and domestic water, which support the high standards in building required for the certification. An easy and accessible laundry area within each unit includes a Whirlpool washer and dryer as well as plenty of storage in spacious cabinets and drawers. Whirlpool stainless steel energy-efficient appliances are also installed in every unit. With the steel sinks, they create a sleek appearance for the kitchen and modern cooking convenience. And, the spacious kitchen island for storage and cooking is ideal for any cooking aficionado. Cold Springs Crossing’s units also include large bathrooms outfitted with smart fixtures and mirrors. Walk-in closets are a nice addition to the units, as well as chic steel constructed patios on the top levels. Landscaped patios for ground-level units provide for outdoor space, as well. Steel construction also serves for the outdoor stairs leading to upper units—great for winter mobility. And since the complex was designed with outstanding insulation, noise is at minimal between units and within the unit space. Cable ready, attractive fixtures, natural light, and programmable thermostats are just a few of the elements that make Cold Springs Crossing a comfortable lifestyle. Renting in Sun Valley at this level of comfort and with easy access to Ketchum along with a view of Baldy’s bowls, Cold Springs Crossing is as good as gets.